This versatile and delicious oil is a combination of our Cold Pressed Rapeseed Oil with naturally infused Lemon to give it a fresh, zesty flavour and a delightful fragrant aroma. Our rapeseed oil with lemon is the perfect choice for those who like a hint of flavour, but not too much that it over powers their food. Wicklow Rapeseed Oil with Lemon tastes delicious straight on a salad or in a marinade or salad dressing – try it on a new potato salad with honey and rapeseed oil dressing. It’s also fantastic drizzled over baked/grilled fish, seafood pasta or simply for dipping crusty bread. Wicklow Rapeseed Oil with Lemon can be used in any type of cooking, even baking – it’s wonderful in a Lemon drizzle cake or to make lemon pancakes. Ingredients: Extra Virgin Cold Pressed Rapeseed Oil infused with Natural Sicilian Lemon Oil which has been extracted from the lemon peel. 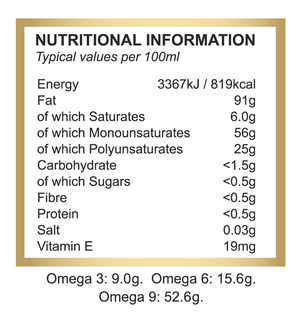 Nutritional Information: All values established as part of a comprehensive laboratory nutritional analysis.